Will India get stake in Belaruskali? Belarus set to sell 25% of Belaruskali potassium producer. Belarus is considering selling 25% of Belaruskali, the biggest producer and supplier of potash mineral fertilizers on the territory of the CIS, Belarusian President Alexander Lukashenko said. "We have offered Belaruskali, and it is not a secret anymore. We have said we will sell not more than 25%," Lukashenko told a government meeting. He said the price had been set but refused to disclose the sum of the deal. "Even though there are few buyers, they are willing to buy it at such a price. Let them buy it, if they want, as the price will not be lowered," he said. Russia's Uralkali co-owner Suleiman Kerimov, and Chinese buyers of Belarusian potash fertilizers have been named as possible buyers of the stake, but they have made no official statements on acquiring the firm. In early August 2010, India, another large Belarusian fertilizer consumer, declared its interest in the stake, while Belarus Deputy Prime Minister Vladimir Semashko said the country would wait for a favorable moment to sell the Belaruskali stake, hoping to raise about $6-7 billion. Lukashenko told his government not to hasten the sale of the country's enterprises. "Do not rush to sell. The world economy is recovering; it is growing. The value of assets is increasing, the worth of enterprises is rising; then let us see, what to sell and at what price," said Lukashenko. He also said Belarus would not live long by selling off assets accumulated by previous generations. 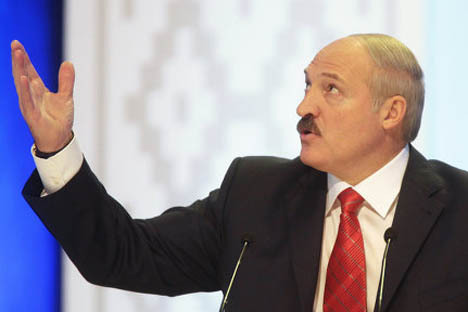 Lukashenko has estimated Minsk could raise $25-30 billion from the sale of its enterprises, but said Belarus should wait to fetch a better price.